Ken Dalton, Chair of BID St Andrews, speaking to St Andrews Business Club, watched by (right) President, Ken Russell. Pic: ASM Media & PR. Our guest speaker was Ken Dalton who spoke about St Andrews applying for Business Improvement Districts Scotland (BIDS) status. Ken Dalton graduated in Environmental Engineering at the University of Strathclyde in 1970 and retired in 2011. Ken was Chief Executive of AECOM Europe a professional services consulting company with Architects/Engineers/ Transportation/Water and Environment designers.The business had 4,500 people in Europe with offices from Dublin to Moscow and was part of a Global company of 45,000 staff with HQ in Los Angeles. Since retiring Ken is Chairman of Mardal the owners of the Adamson restaurant in town. 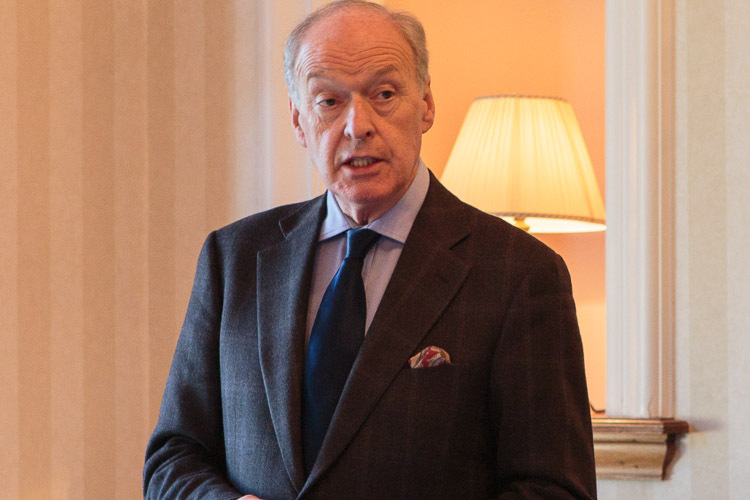 He is also a non-executive of the Court of the University of St Andrews, Chair of BID St Andrews and Lord Dean of Guild of Edinburgh. Previous recent appointments include Master of the Merchant Company of Edinburgh, non-executive at the Royal Zoological Society of Scotland, and Renter Warden of the Worshipful Company of Plumbers in London. Ken is married to Marge and they have two children Julie and Graham. His interests are music, theatre, art and bad golf.